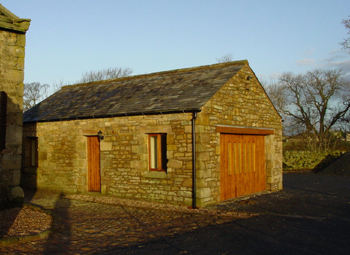 At Brocklands there is a large, old stone barn dated 1714 next to the car park. Adjacent to this fine building is a smaller one which we have called The Haybarn. This has been converted to a high standard, keeping its original beams and slate roof, and all the new woodwork is of English oak harvested from our own estate woodlands. It provides modern facilities for the burial site: a fully-carpeted room, with heating and double-glazing; a sink (with hot water) and small preparation area at one end; and a separate toilet. A series of six windows offers a fine outlook across the Ribble valley. It is ideal for a celebratory service prior to burial. 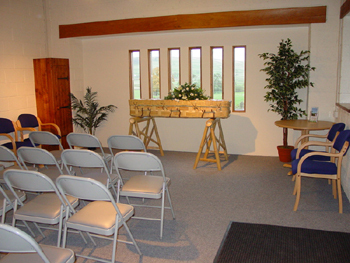 The Haybarn is available for use in conjunction with any burial at Brocklands, either before or after an interment or both. There is no extra charge for this - as of 1st April 2017 all Haybarn fees have been absorbed into the main Burial Fee. Families and individuals often wish to come and ask questions about natural burials, either because they are thinking ahead for themselves or because a family member has died. The Haybarn is a convenient place to meet people and talk through the options, over a cup of tea, and afterwards we can take them across the car park to the burial area, to show them the layout, the variety of trees and plants and of course to see the views up the valley towards Settle and the Three Peaks. The Haybarn can accommodate up to 45 people for a service, with about 30 of these seated. Services may be with a minister, a humanist celebrant, or the family may wish to conduct the service entirely themselves, with music, pictorial displays and flowers. We can provide contact details for celebrants, and Funeral Director services (see the Burials page). There are electrical sockets around the room, for CD players, keyboards etc., and families may bring their own equipment to use. Families are welcome to use The Haybarn for serving refreshments after a burial. We will supply all necessary hardware for this - tables, chairs, cutlery, crockery etc. We do not offer the catering services, but we are happy for families to provide their own refreshments, or alternatively we can suggest local caterers who will come in to provide this.